Now it's fairly common knowledge that a child will pick up certain familial traits from their own parents. For example, if your Father has brown hair, there's a pretty good chance you will turn into an axe-wielding maniac. You know. Like the one seen in the following 85 minute movie made in 1971. It was Directed by: Peter Sasdy; and Stars: Eric Porter with Angharad Rees. Why thank you for taking me into you're care, Doctor Pritchard (Eric Porter). Honestly, good sir. I'm ever so grateful to you and your son, Michael (Keith Bell), because I haven't been feeling myself ever since my boss was killed a couple of days ago. Well, one minute I'm feeling pretty fine and dandy. And the next minute I'm standing over a dead body and feeling like sh*t. I mean, what could possibly be causing that, eh? Surely not a genetic connection I have will a well known Victorian serial killer, perhaps? You know. What's his name. Huh? What's that you say, dear Doctor? You think this is true? Cause that would logically explain away why my boss Mrs Golding (Dora Bryan) and your housekeeper have been ripped to shreds one after the other? But then again, that's most probably why what next transpires all screams blue murder when you say to me, 'Anna (Angharad Rees)! You are the daughter of Jack the Ripper'. As Mister Dysart (Derek Godfrey) points us in the right direction - another clairvoyant get's a mighty rejection - Jack wants to show us his new skinny balls - and at the end of the day, this adventure finally goes splat at the base of Saint Paul's. 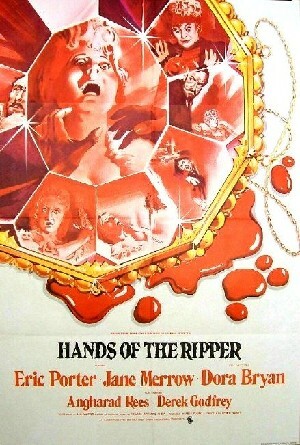 Essentially I'd say 'Hands of the Ripper' is a psychological thriller which is more of a 'why did they do it? ', rather than a 'whodunit?'. Well, to start off with this piece presents to us -- the audience -- with a flashback sequence where Jack the Ripper's daughter witnesses her father killing her own mother before her very eyes. 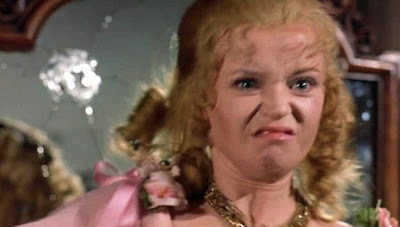 And then, once the title sequence rolls, we then see the daughter in question all grown up -- as played by Angharad Rees -- and haunted by her father who forces her to kill-kill-kill. However, help is at hand in the form of a very nice Edwardian doctor -- as played by Eric Porter -- who takes her under his wing and tries to solve this problem with the use of all of that physiological bullsh*t.
Oh! Wait a minute. Please don't get me wrong, dear reader. I'm not trying to imply anything negative here. If anything I thought this was one hell of a classy piece of film-making, and has all the hallmarks needed of being a great murder mystery. Not only do you have a pretty damsel in distress plus the elegance of yesteryear, on top of that you also have an enveloping story-line that is somewhat intriguing to follow, because it possesses that 'what the f*ck is gonna happen next' type vibe about it. Funnily enough, from a narrative point of view I could easily compare 'Hands of the Ripper' to the 1999 Gabriel Byrne and Patricia Arquette movie, 'Stigmata'. Yeah. I'm not yanking your blade, film fans. Both of these films are about women who get possessed by malevolent spirits, and are forced to do things they wouldn't normally do. Granted, in the case of this flick, most of the production values are more 'Seventies British' than 'New York Gothic'. Plus I suppose you could say the overall through-line was much more timelier in tone. Still. As push comes to shove my comparison holds water for anyone who's watched both films. And it does give you a fairly good impression of what to expect if you watch it, folks. Now on the flip side of things occasionally I wasn't too keen on how it depicted the good doctors erstwhile actions because they weren't always that apparent. What's more, I wouldn't call it a one hundred percent genuine 'Jack the Ripper' movie either. He's hardly in it, and some the facts presented don't seem to apply to him whatsoever. Having said that, though, none of this matters very much within the scheme of things. This is still a very good movie, and what now follows are my ever so humble filmic-facts. (1) 'Hammer Film Productions' first released this thriller in England on the exact same day Judy Rankin won the LPGA Quality-First Golf Classic. It was on the 17th of October, 1971. 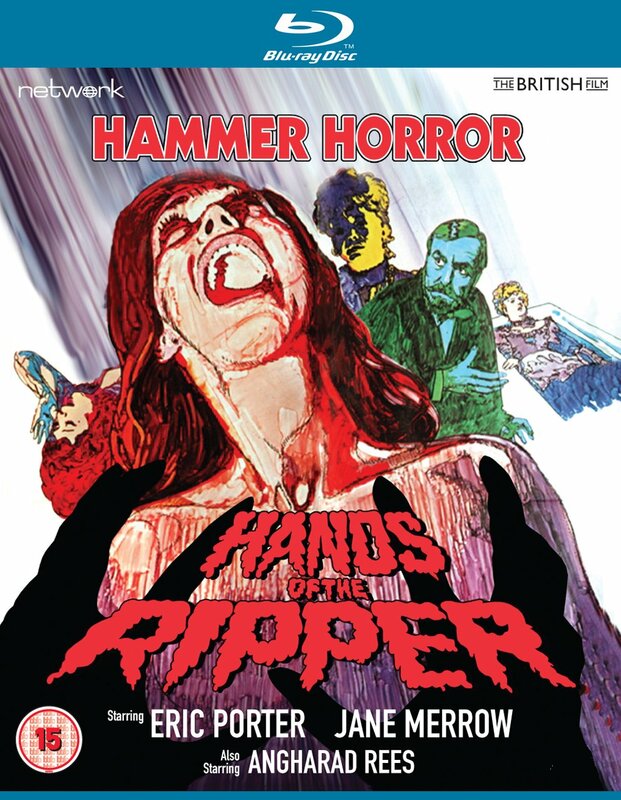 (2) Loosely translated, this project was entitled 'The Bloody Hands' in Sweden; 'Hands Choke' in Mexico; and 'The Daughter of Jack the Ripper' in France. 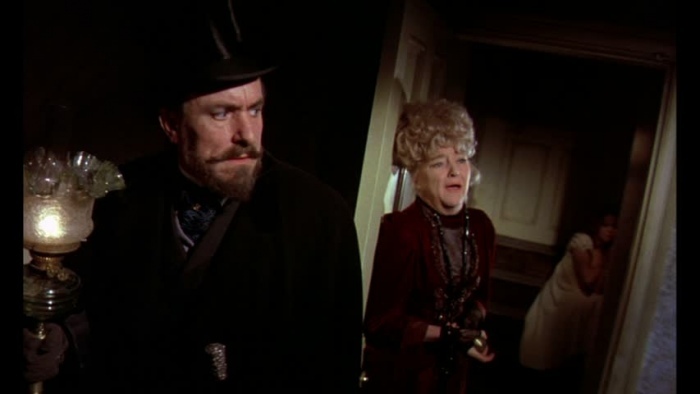 (3) The character played by Lynda Baron in this flick -- Elizabeth 'Long Liz' Stride -- was named after 'the real' Jack the Ripper's third victim. (4) For some unexplained reason the American censors thought it would be a good idea to remove approximately 16 seconds from each of the murder sequences. (5) This was the only project L.W. Davidson ever co-wrote throughout his very short-lived career. (6) The majority of this movie was shot at 'Pinewood Studios', Iver Heath, situated within the English county of Buckinghamshire. And no. That wasn't St Paul's Cathedral you saw at the end of this flick. It was a sound stage located at the aforementioned studio. (7) Upon its release, this adventure shared a double bill with another 'Hammer House' movie -- 'Twins of Evil' -- which starred Peter Cushing. (8) This was 'Hammers' second attempt at tackling a 'Jack the Ripper' related film project. Their first attempt was in 1950 with a movie called 'Room to Let', starring Jimmy Hanley and Valentine Dyall. (9) For any more Ripper related information please click on over to our pals at The Jack The Ripper Tour. Overall I'd say 'Hands Of The Ripper' is a pretty decent film. The story-line is a very intriging one to follow. The cast played their respective parts in a fairly timely manner. And all in all -- yeah -- good job -- as I would definitively recommended it to any of you ripper fans our there, despite it's somewhat loose association.